Q LINDO SE VE CHRIS JAJA,LINDO DIGO HERMOSO JAJAJA. chris pelon jajaja..q lindo XD. 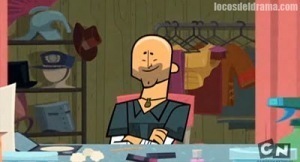 Wallpaper and background images in the Total Drama Island club tagged: tda total drama action. I know what she said. im spanish so I can translate that. she said, "chris is bald, hahahahahhahahahah!"